5つ星のうち4.0A bit of retcon never hurt anyone....right? This story changes a bunch of "Jack Russel's" back story so what you think you know mostly isn't so anymore. It is a MAX title so that's almost to be expected since it has been kind of common with other MAX titles in the past. They don't always stick with what happened in the mainstream Marvel Universe, and often what happens in the MAX titles doesn't happen in the main MU either. I was reminded of two different stories while reading this. 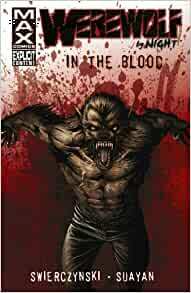 One was the classic appearance of the Werewolf by Night in Moon Knight #29 (one of the earlier volumes) where the werewolf looked more like the creatures in "The Howling" than from "The Wolfman". In that book and in this one there are some similar story elements about people wanting the wolf for their own purposes. The reasons aren't too different but this book gives them a more modern slant and less of a supernatural one. The other similarity is that the wolf is violent and does kill people. The early "Werewolf By Night" books he was kind of like a hairy Hulk in that he never managed to hurt anyone even with all the mayhem he created. The other story I was reminded of was the BBC series "Jeckyl". The relationship between Jack and the wolf is a bit more like that of Doctor Jeckyl and Mr. Hyde than a man and a monstrous wolf. There are some other elements that vaguely resemble bits from that show but I won't spoil them here. The artwork is pretty good with an interesting design for the werewolf. I'm rather partial to "The Howling" style werewolves myself since that was new when I was a kid but this version is a more savage and brutal looking version of the classic Wolfman style that the original comic look was based on. I think the MAX titles tend to change the history of the characters a little too much, but I still find the powerful writing more than makes up for the small changes that the writers make. This title includes the MAX version of Werewolf by Night and a couple of issues of the Marv Wolfman tales that show Jack's first meeting with Dracula. There is a STARK difference between the two. Wolfman's comics were written at a time when his creative hands were tied behind his back and it comes off very childish compared to the MAX version. The MAX version is unflinching, bloody, and very well written. I actually cared for Jack Russell in the MAX version. It was clear that he knew what he was and he was trying to do the right thing. I wish there were more of these, I'd pick them up. As a fan of Marvel's original "Werewolf By Night" series, I was somewhat disappointed by this new addition to the story of the werewolf. Did the writer not bother to read the original series? After all, it is available as a Marvel omnibus. Just saying. If you're a Werewolf by Night completionist then sure, just to check it out, or if you are really curious about it, then sure, it's fairly cheap to buy, otherwise, it's a pass, since it's only connected to the original series in two ways: The main character is Jack Russel, and he turns into a werewolf on the full moon. Other than that, really has nothing to do at all with the series it's named after, and might have benefited from being not being tied to the series.